This is going to be a quick one. 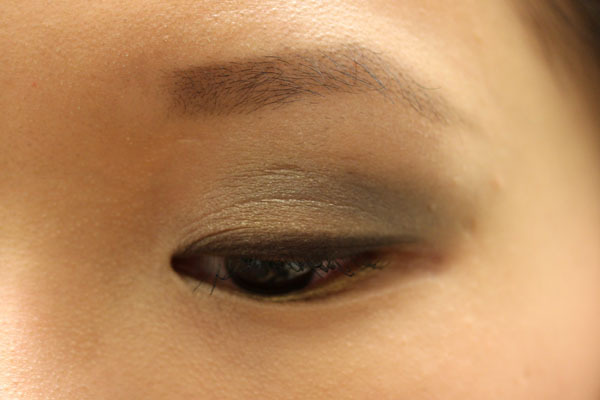 I wanted to show you how the NARS Hanamichi Kabuki palette performed on the face in case you were on the fence about whether to plunge into the purchase. First, apologies for the robot faces. I'm falling into a kind of restlessness that's been hard to shake off and it must have showed up as the impassive façades you see below. I utilized all four shades in the palette to create this look. The gold was used as an all-over wash and bottom lash liner, the black in the crease and top lash liner, the red as a blush, the white in the inner corners and as a highlight in the form of a vertical strip down the nose as well as above and below the eye brows. Most of the shading is done with the included mini brush to test its efficiency. Turns out the included brush is not the best out there, which is a slight disappointment though not unexpected. It doesn't ruin the palette for me since I hold that the efficacy of an included brush is a bonus, not a necessity. That said, while the brush felt like a rake across my lids, it does work. I found the best way to use it with minimal pain is to pat the color onto the eyes and then blend it out sparingly. The more delicate your wristwork, the better. Now, I know the big $65 question is if the palette is still worth the cost now that I've used it as an actual makeup item. Based on the colors alone, I have to say no. While they do work well together, it's not that hard to come across these shades individually. In fact, you probably already own similar if not exact iterations of all four shades in your makeup stash. But we all know one doesn't buy palettes like these for mere functionality. That's what permanent items are for! Apart from the plainness of the hues (and I suppose the scratchy brush), I have nothing else to complain about the palette. Therefore, if you're inclined toward the extraordinary and exclusive, I would still recommend this palette to you as a keepsake. 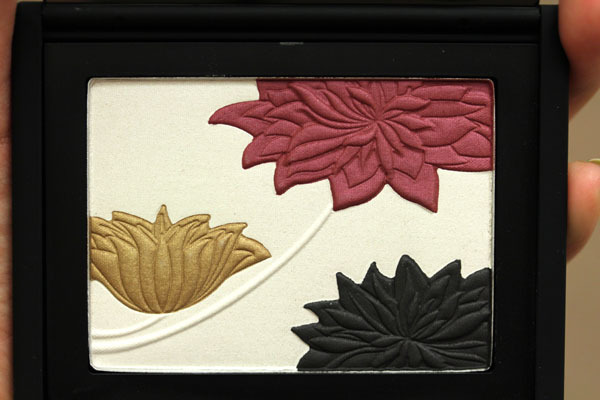 From what I've read around the Web, the Hanamichi Kabuki palette should be available on narscosmetics.com on November 1, exact time unknown. Leigh pointed out in the comments section that Nordstrom currently lists it as in stock, but who knows how long that will last. Hesitance is not a virtue when it comes to picking this up. Get to it before it's too late! Oooh,I saw this in Elle (I think?) that's a disappointment about the brush but I wonder if it would soften after a washing w/baby shampoo? After reading and seeing your pictures, I'm a bit disappointed. I will probably pass. I can no longer purchase palettes without actually using them. Thanks for saving me $65! Ahhh! A la Tim Gunn, you made it work! Too bad about the brush. I recall reading on Pink Sith or Non-Blonde that the Barneys special edition kabuki brush set had to be washed before initial use, so I wonder if this applies here as well? I love this look! FYI - once you wash the Kabuki brush with brush cleaner and dry it, it will be much softer. The palette is gorgeous and so is your look. Thank you for showing us how to use it. I agree with your assessment that the shades are dupable and that it's definitely a collector's item! 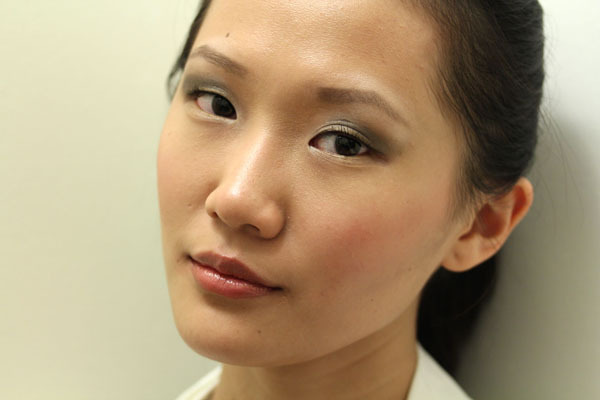 Gorgeous look- I love how the burgundy shade looks as a blush! Gorgeous look! What lip color are you wearing? I love it! Thanks guys! Will try washing the brush and see how it fares.